This newsletter is dedicated to YOU, your faith and support of Full Moon Farm. To our long term benefactors, the last ten years would not have been possible, with out your support and compassion to our animals. To our newest supporters, thank you so much for joining our passionate group, and please, allow me to bring you up to speed about Full Moon Farm, and our 10th Anniversary! I became involved with wolfdogs as first, an owner of two low content wolfdogs, and then, after falling in love with this breed, I wanted to share these wonderful animals. The only wolfdog breeding I did was for friends and family. My interest and conscientious goal was in creating a healthier animal as opposed to purebred dogs with varying degrees of genetic defects that flood the pet dog world. 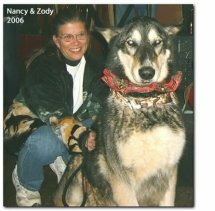 In 2002, I attended a convention in Atlanta and spoke with several members about my hopes of helping wolfdogs on a grander scale, through rescue. 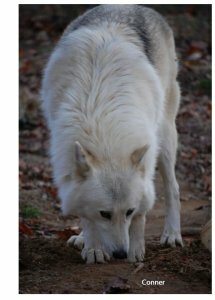 It was recommended I contact Loki Clan Wolf Refuge, located in New Hampshire. I called and spoke with their Rescue Coordinator. She informed me of a multi-organization rescue effort, and asked if I would like to help. My fate was sealed and I found my heart's calling when I chose to give refuge to sixteen wolfdogs. I realized I could truly help these incredible animals as a rescuer and educator. The spark ignited the passion, and Full Moon Farm, Inc., Wolfdog Rescue and Sanctuary was born. 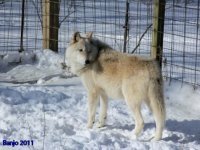 Full Moon Farm still has four of those original sixteen animals, and they serve as a testament to the sanctuary's commitment to the 'MYTHunderstood' wolfdog. Full Moon Farm, Inc., was incorporated in 2002 as a NC non profit, and registered as a 501 ( c ) 3 charitable organization by the IRS in February of 2004. We are one of the largest and oldest facilities in the country. While we have become a sustainable organization, over the course of the last ten years, with the blessings of our donors; we now find ourselves, in this economy, facing the same financial issues as many other organizations. Our goal this year is to raise $90,000 dollars, to help meet the increasing cost of medical care, enrichment program, enclosure and building upgrades, education programs and community outreach. We believe this goal is attainable, with your support. We appreciate all that you do for us, and we are hoping, this year, is the year of growth. With your help, we can get there! There are several ways to support our Sanctuary, so, please help us kick 2012 into high gear!! Cash/Check Donations as well as needed below! Stainless Steel Pails/ Buckets – 9 qt., 13 qt. And 20 qt. We are funded by your generosity, and your tax deductible donation helps keep our animals fed and healthy! Help us help the wolfdogs - "Paying it forward, one howl at a time." Thank you! Our first Howl-In of 2012 will be Saturday, April 7th. Tours of the Farm start at 3:00 p.m.; potluck supper begins at 5:00 p.m. Bring a side dish and join the fun! For info and directions, please call 828-664-9818 or email info@fullmoonfarm.org. Our full Howl-In schedule is available here. We are also looking for any grocery stores, restaurants or cafés that would like to become a Pack Patron by contributing the main entrée for 60 people for each month's Howl-In. For more information on that, please contact Sarah Hallback.